At Seabury School, we build our program around the understanding that being gifted is not just a school thing – it’s a person thing. Gifted children and adults, with their intensity, high degree of sensitivity and awareness, abstract thinking ability and ability to learn quickly, experience the world differently than typically developing children and adults. In developing Seabury’s program, including the support we offer for parents and the community, we pay close attention to meeting the needs of the whole child – intellectual, social, emotional and physical. We work to provide developmentally appropriate activities for all grade levels, taking into account our children’s intellectual, social, emotional and physical development. In the prekindergarten class, you will see this in the hands-on activities that make up the vast majority of the day, which are accompanied by deep, intellectual discussions and complex problem solving, all in the context of materials that work with 4-year-old hands and topics that are of interest to 4-year-old sensibilities. At the middle school, you will notice students doing amazing, challenging projects using their laptops, but will also notice teachers coaching these pre-adolescents to not leave their computers on the floor or watch where they plug them in – simple things that preteen brains don’t always pay attention to. Students with intense needs to move have opportunities to do that in Seabury classrooms which provide students the freedom and flexibility to work and learn in ways that work best for both their minds and their bodies. This month, our focus is on all the ways Seabury supports our students in building healthy, active bodies to go with their active, healthy, engaged minds. Our lower school P.E. program offers opportunities for building healthfull habits around exercise, eating, play and sportsmanship, as well as opportunities for students to challenge themselves in group problem solving and team building activities. Our middle school students are out and about in Tacoma nearly every day, and do their P.E. in the same way many adults get their exercise – by working out and playing at the downtown YMCA. 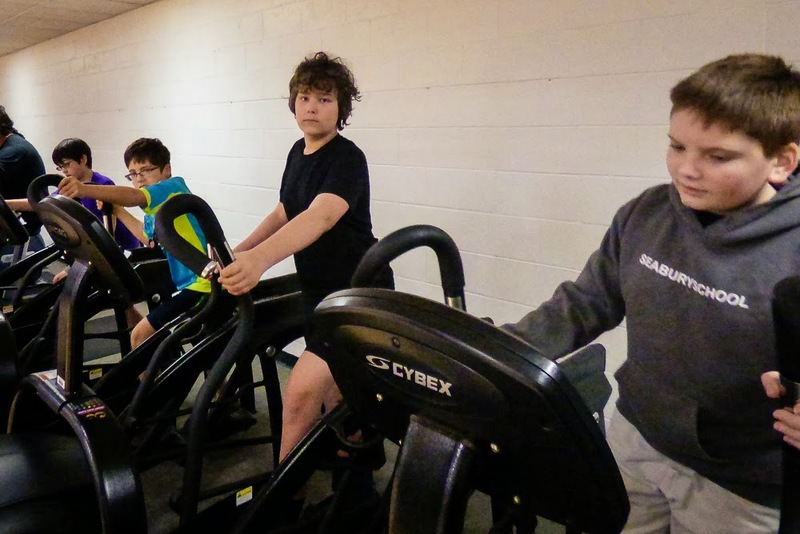 In addition to getting stronger, our students are learning how to conduct themselves at a health club, learning how to use the equipment, as well as play games in the gym and run on the track. They learn gym etiquette, and because the downtown Y is an adults-only facility, they learn to handle themselves in a place that expects adult conduct and behavior. After-school programs, mindfulness in the classroom, recess activities such games and gardening and Summer at Seabury programs all add to opportunities for students to grow healthy bodies as well as engaged minds.